This thread on pepipoo details a case where SIP took a motorist to court. The case involved a situation where the motorist purchased two tickets to cover their parking because they suddenly realised they would need more time. The tickets were overlapping, and SIP argued that the expiry time ended with the time on the second ticket. The motorist argued that they had purchased 4 hours and so should have 4 hours parking. In such a case like this, The Prankster believes the contract laid out by the signage would be key. Of course, any reasonable parking operator would also cancel the charge; no monies have been lost and no abuse has taken place. It would also help if the signage was readable rather than being written in a tiny font 9ft high in the air. Additionally, as there is no signage by the pay machines themselves, it is not clear that any terms on the signage would in fact be enforceable. The Independent Appeals Service rejected the motorists appeal, ruling that he had paid for two hours twice, rather than 4 hours, and that a contract was in place. One year later a real judge ripped into SIP over the fact that the motorist had paid for enough parking time against their tariff board, all be it over two over lapping tickets. The basis of the ruling was the different company names shown on the car park signage which conflicted with the Consumer Rights Act 2015 in terms of giving clarity on t&c's. SIP attempted to use both the IAS appeal verdict and the ParkingEye v Beavis, but the judge rightly countered these arguments. This case also serves as a warning to any landowner considering using SIP; SIP are more than happy to target your legitimate customer base, driving them away to your rivals. SIPs own web site contains similar cases. Here is one where they pursued a motorist even though their machine stole her money without giving a ticket. Here is another where their machine did not work. Here is another - this case is slightly different in that...the machine did not work. In this case, the driver purchased a ticket but it slipped off the dashboard. In this case, the driver purchased a ticket but it slipped off the dashboard. It does seem like SIP pursue genuine customers who have purchased ticket to park, and also use their machines being broken for extra income. Finally, the IAS offer two services. In one, the motorist pays £15 and the IAS decision is binding on them. Given that there are no known cases where an IAS decision has been upheld by a real judge, The Prankster considers it would be madness for a motorist to consider using the IAS. The Prankster suggests using the Consumer Ombudsman instead. ParkingEye's strategy of deliberately not bothering to get advertisement consent appears to be backfiring in some car parks. 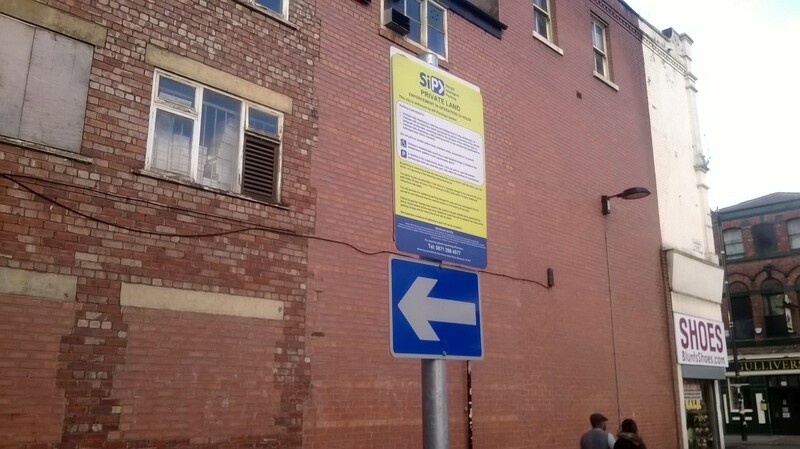 ParkingEye's signage is classed as an advertisement, and it is a crime to have signs erected without advertisement consent. Here is a photograph from the Priory Centre in Worksop. 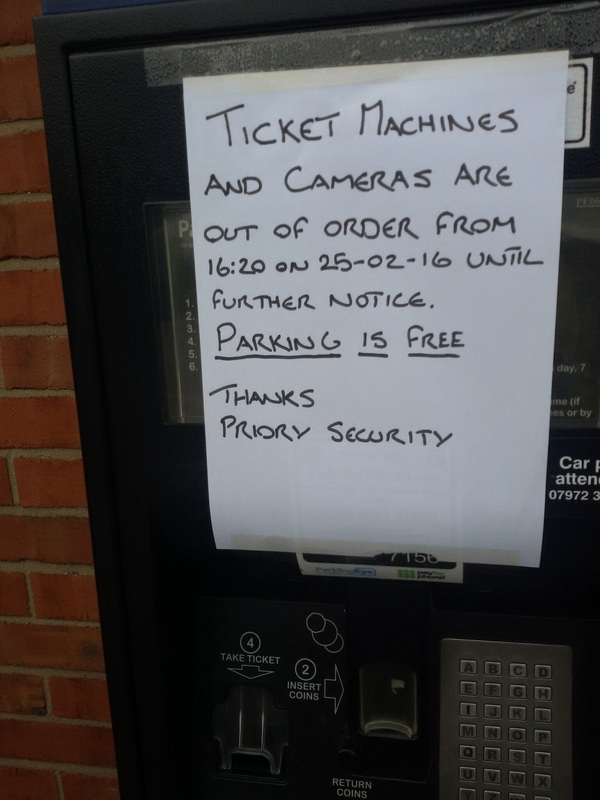 From 25th February it seems the cameras and ticket machines are 'out of order' until further notice. The Prankster wonders if this is a result of the enquiry Bassetlaw District Council are conducting into PE's use of ANPR cameras. The Prankster has also received an unconfirmed report that in Mansfield the council slapped an enforcement notice on ParkingEye who ignored it so they sent someone round to remove signage and cameras. ParkingEye are forced to apply for permission and cannot use their kit until it is granted. The Prankster can confirm this is not correct (at least up to last Thursday) and that Mansfield has invited ParkingEye to submit an application for advertisement consent and planning permission for its ANPR cameras at the St Peters Retail Park. The council has not taken enforcement action and has up to last Thursday has refused to cover over the signs. If anyone can confirm these two reports or has more details, please contact The Prankster. Meanwhile in Liverpool, the planning wrangle at Liverpool Airport drags on. The airport applied for permission for Vehicle Control Services' illegal signs back in March 2015, but the council still has not made a decision on planning application 15A/0657. Helen Dolphin has sent The Prankster this information, which is published as a right to reply. 1) People’s Parking is not just for members of the IPC it is for all car parks and in fact my first customers are BPA members not IPC. 2) I am not in anyway controlled by the IPC they just did my website that it all, yes that really is all they did. If I had £30K I would have done it myself but I don’t. Eventually maybe I will get my own done if improvements need doing in the future because it would be unfair to keep expecting the IPC to help me for nothing. 3) Since my accreditation is for BPA and IPC car parks I don’t see how you can say car parks with the accreditation are more likely to get a ticket, that is nonsense except I do say Blue badge bays must be enforced which disabled people agree is a good thing. 4) I am not a scammer I do not cheat or defraud and this is libel. 5) I have read the posts under your post which you are also responsible for, I was not sacked by DMUK I left to set up my own business or which People’s parking is just a part of. You are not someone I wish to have any further discussions with. I initially cared what you had wrote but since I have been sent information on you I realise you are worth no more of my time. You claim to help motorists but all you do is attack people like me who work tirelessly on behalf of others. What you write about me and my business carries so little weight as anyone who knows me or reads about the work I do will know that I would never scam anybody so all you are doing are discrediting yourself. In a previous post, The Prankster analysed the People's Parking website. When The Prankster investigated the website it was not fully formed. There was no contact information and no information about the accreditation process. Since then the website has been updated and it appears that the owner is Helen Dolphin, formerly of DMUK. The Prankster has contacted the owner of People's Parking, Helen Dolphin, to seek out her views; however, it appears they will have to agree to disagree. While Ms Dolphin may believe she is trying to drive up standards in parking and create car parks which are better for the public, The Prankster believes she is being used by the parking industry for their own ends, in order to legitimise bad practices and provide an accreditation which the worst miscreants can sign up to. The Prankster has carefully studied the handbook, which appears to be currently not available. 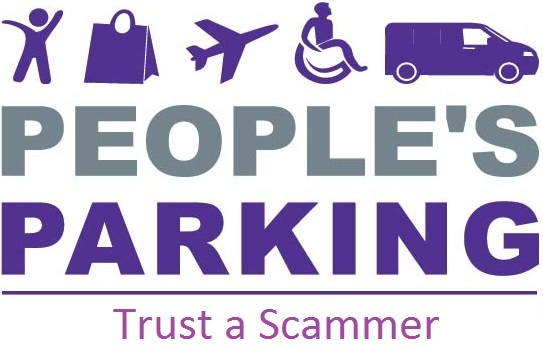 However, the copy The Prankster downloaded was worryingly light on signage and enforcement, essentially allowing parking operators to get away with all the scams they are currently running. Here is one such example; a wizard wheeze by bottom feeders Armtrac, who moved from the BPA to the IPC, thus simultaneously raising standards in both organisations. 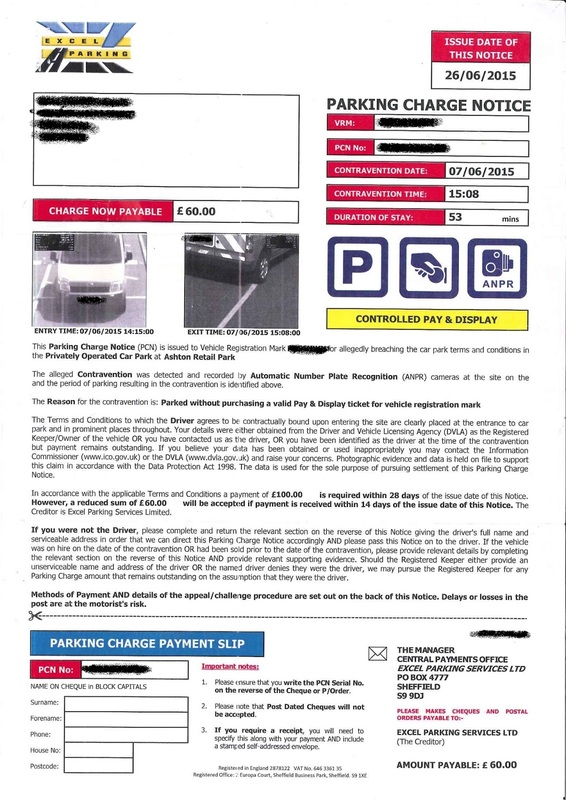 In this post on moneysavingexpert, the motorist explains how Armtrac hid the fact that the vehicle had a legitimate ticket by covering it with the Parking Charge Notice and then taking a photograph. The IPC have a relentless drive to lowering standards in the parking industry, removing safeguards for motorists with each release of their code of practice. The IAS appeals service is a bad joke, with even their own members realising this. While the domain registration is now no longer owned by Gladstones Solicitors, it has only moved the width of a piece of paper. Patron Hallow is apparently a shell company owned by Will Hurley and John Davies, the two owners of the IPC. People's Parking, the IAs, and the IPC are all hosted on the same webserver, sharing the IP Address 212.48.72.40. The Prankster believes that People's Parking should distance themselves from the IPC, move their webhosting and domain registration, and should update their handbook to promote fair parking enforcement. The Prankster believes that motorists should avoid car parks run by IPC members like the plague, due to the large number of complaints he receives about IPC members, and because motorists cannot get a fair appeals hearing. A new entrant to the lucrative 'give me £100 to rate your car park' market has arrived - People's Parking. John Davies also runs the Independent Parking Committee, an organisation famous for its lax policing of its members and an appeals service which has all the characteristics of a kangaroo court. The Prankster believes that these types of behaviours are indicative of a scam. Motorists using a car park are entitled to believe it is being fairly managed for the benefit of all; not managed in a way to issue as many charges as possible, legitimate or not. The Prankster therefore believes that it is fair to call operators using these tactics 'scammers'. Based on this, the liklihood of receiving a charge at a People's Parking car park appears to be a lot higher than one run for the actual benefit of the people. Car parks with the People's Parking award seem to The Prankster to be ones to avoid at any cost. However, even scammers have families which they need to feed, so perhaps The Prankster should not be so harsh. Perhaps a fairer way would be to introduce an addition to the logo so that consumers can make the choice. The Prankster suggests an alteration to the logo, which People's Parking can use at no charge, in those particular car parks which deserve it. In a worrying move the British Parking Association recently appointed parking company debt collectors Wright Hassall as brand-POPLA agents to deal with stayed cases. Wright Hassall have for some time regularly made it obvious they do not understand parking related law. This current thread on pepipoo confirms they are still clueless and motorists are likely to get shafted during the upcoming appeals process. The pepipoo case concerns a parking charge from Excel Parking, and as any fule kno, Excel Parking do not rely on keeper liability but pursue the keeper on the basis that they were the driver. Here is a typical Notice to Keeper from Excel (from stock data on the BMPA website, not the actual one in question). It is missing at least the statutory requirements specified in 9(2)(e) and 9(2)(f) of the Protection of Freedoms Act 2012, schedule 4. In this case, the keeper was not the driver, and therefore directed Wright Hassall to drop the charge. You have confirmed that you were not the driver at the time of the contravention. However, Paragraph 9(2)(b) of schedule 4 of the Protection of Freedoms Act 2012, states for parking events in England & Wales that the operator must inform the registered keeper that the driver of the motor vehicle is required to pay the parking charge in full. It also notes that, as the operator does not know the driver’s name or current postal address, the registered keeper, if they were not the driver at the time, should inform the operator of the name and current postal address of the driver and pass the notice to them. Further if you have previously confirmed the details of the driver and they have not made payment or denied responsibility, Schedule 4 of the Protection of Freedoms Act 2012 states liability remains with the registered keeper. In The Prankster's opinion, it would be difficult to find somebody with a poorer understanding of parking related law than the Independent Appeals Service, but Wright Hassall seem to have scraped that barrel. To dissect their incompetence, Wright Hassall have started out by misquoting 9(2)(b), which states nothing of the sort. They refer to registered keeper, while the Act refers to keeper. The two are not necessarily the same, as the Act makes clear in 2(1). They then misquote 9(2)(e), somehow turning an obligation of the operator into an obligation of the keeper. Along the way, they once again mangle keeper into registered keeper, and state that a current postal address of the driver is required. This is wrong - the Act defines the requirements to also allow 'an address at which the driver can conveniently be contacted'. Next, 9(2)(f) is similarly reversed, magically changing from a operator obligation into driver obligation. The choice of paragraphs is exceptionally ironic, as Excel Parking miss out both 9(2)(e) and (f) in their notices. In short, Wright Hassall totally fail to acknowledge that Excel's notice to keeper is not compliant with keeper liability. Finally, Wright Hassall dive into the realms of fantasy, stating the keeper remains liable if the driver has not made payment or denied responsibility. Nowhere in the Act is this stated; the keeper can provide the name and address of the driver any time up until the beginning of proceedings. Once they have done this, their liability ends, regardless of whether the driver pays. Presumably Wright Hassall meant to say the keeper is liable if the driver denies responsibility, rather than has not denied responsibility, but regardless, they are wrong. Whether or not the driver denies responsibility**, the keeper has fulfilled their obligations and are no longer liable. The Prankster is frankly, flabbergasted. The Prankster is still flabbergasted. These are the people that the British Parking Association have selected to represent brand-POPLA, and they fail the basics of parking law. The Prankster considers that knowledge of the Protection of Freedoms Act 2012, schedule 4 is a mandatory requirement for that role. However, Wright Hassall's incompetence does not end there. They state their letter before claim complies with annex A and B of the pre-action protocol without realising these ceased to exist almost a year ago, in April 2015. A solicitor firm filing claims who do not keep themselves current with the pre-action protocol hardly inspire confidence. Any person who makes a contract in his own name without disclosing the existence of a principal, or who, through disclosing the fact that he is acting as an agent on behalf of a principal, renders himself personally liable on the contract, is entitled to enforce it against the other contracting party. It therefore follows that a lawful contract between the car park operator and the motorist will be enforceable by the car park operator as a party to that contract. This is supported by case law of Fairlie v Fenton (1870 LR 5 Exch 169). The Prankster agrees with Fairlie v Fenton, but the crucial part is 'renders himself personally liable'. Essentially this means the operator can sue the motorist if the motorist can sue the operator. In practice, this rarely is the case. The benefit to the motorist is the provision of a parking space, but if that goes wrong, the operator is quick to absolve themselves of responsibility. If the parking surface has a pothole and a vehicle suffers damage, or if the car park surface is covered in ice and the driver slips getting out of the car, then typically it will be the landowner the motorist sues, not the operator of a pair of cameras. Additionally, if the motorist is driving a hire car and wrongly gets issued a ticket, they often find themselves the recipient of a £50 administration charge from the hire company even though the parking charge is cancelled. In such circumstances the parking operator is quick to deny of responsibility stating it is not their fault and they are acting as agents of the landowner. Clearly then, in the majority of cases Fairlie v Fenton acts to the benefit of the motorist, not the detriment. Along the way, Wright Hassall also misquote the IAS appeal procedures, stating that if a motorist appeals within 21 days they must pay a fee of £15 and the result is binding on them. This is not correct, and those conditions only apply to appeals made after 21 days. As the car park in question is the Peel Centre, one of the worst signed car parks in the country and one which forms a sizable part of The Prankster's mailbag, nothing could be further from the truth. Here is a map showing just how bad signage coverage is in part of the Peel Centre. Only the bays in green have a reasonable chance of noticing signage. Bays in red have almost no chance. Of particular concern is the dearth of signage by disabled bays. The Prankster considers Excels disrespect for disabled drivers in this car park as wicked. So there you have it. The British Parking Association have appointed parking company debt collectors to deal with motorist appeals, who clearly are incompetent and not qualified to do the job. **If the nominated driver denies they were the driver, this is a different matter. The Parking company could in theory pursue the keeper, who would then need to prove on the balance of probabilities they correctly named the driver. The Prankster has seen this situation a few times, mainly between ex-husband and wife. Trebles all round for Gladstones Solicitors as they managed to convince yet another hapless parking company to use their services. With Gladstones scoring fees for the legal profession for filing the claim and preparing the witness statement, not to mention the legal representative used in court, the parking company will have shelled out 3 times to various legal firms for the pleasure of being trounced. The matter concerned a parking charge initially for £25 invoiced by Park With Ease. This case will have cost an estimated amount of £300 in legal fees alone. 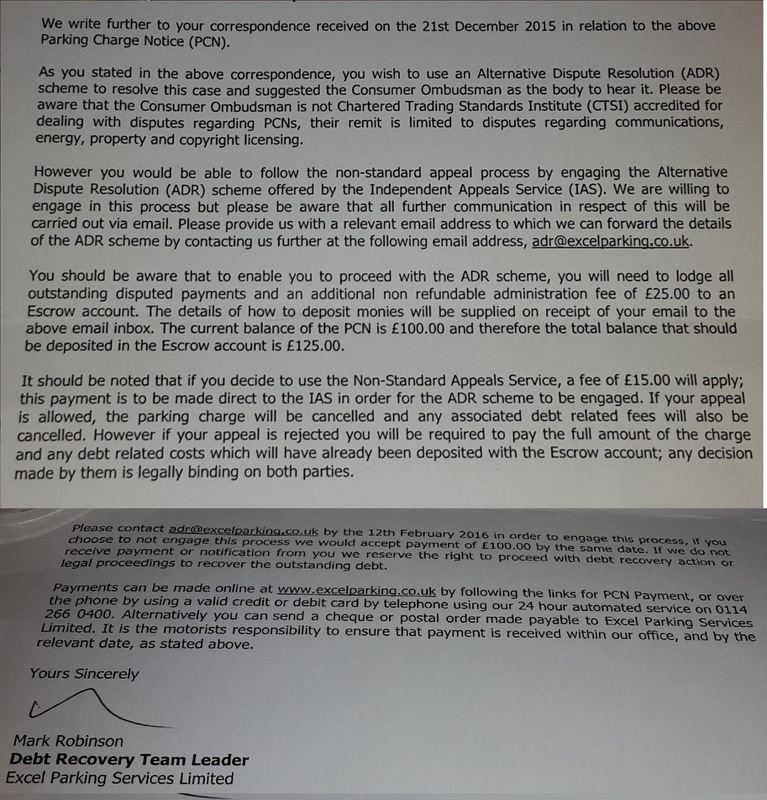 As this is not reclaimable in the Small Claims track, the Gladstones sales team are presumably experts in their field to convince parking companies it is worthwhile to fork out 12 times the initial charge. Gladstones are fast become the joke of the parking industry with a series of high profile losses in court, and no reported wins against any defence, let alone a substantive one, so the sales force are no doubt experts in the persuasive arts. The motorist had paid the correct parking charge, but his wife had entered the registration incorrectly. Park With Ease's own evidence showed the machines were unreliable and had 3 false payments with no matching registration numbers around the time of the parking event. The defendant also pointed out that TripAdvisor and other web forums showed a number of other motorists being scammed in the same manner. The Park With Ease representative quibbled about the defence witness statement, trying to insinuate there was an anomaly and that the motorist had not really paid. The judge ruled that the case hinged on whether the motorist had paid or not, and that the burden of proof lay with Park With Ease to show that the motorist hadn't. As he felt they hadn't been able to show that without any doubt the claim was dismissed. Another well deserved win for Gladstones Solicitors sales team as they trouser bucket-loads of cash from the ill-advised parking company, and of course a well deserved win for the motorist in getting the claim dismissed. It is perfectly possible to install parking machines that work properly and only accept valid registration numbers. Park With Ease would be well advised to use this type of machine rather than waste their money persecuting motorists because their own system is flawed. At some point no doubt parking companies will wake up and smell the coffee and realise that Gladstones are taking them for a ride. Landowner warning - do you want Devere to operate your car park? The Prankster received a worrying report about Devere Parking Services Limited, who held a motorist's employers to ransom to attempt to enforce a parking charge. In The Prankster's opinion Devere do not provide genuine car park management, and instead use aggressive parking enforcement to generate income for themselves without providing a proper service. A typical Devere operation is to 'manage' a business car park by issuing permits to permitted workers. Sadly however, Devere make their money not from unauthorised motorists abusing the car park, but from genuine users. Typically these genuine users will be penalised with huge charges for trivial matters such as permits falling of the windscreen. This is of course not proper management. A genuine parking company would on investigation and confirmation the motorist had permission to park, cancel the charge. The parking company incurs no substantial cost in doing this, and no abuse of the car park has taken place. Today the government stated their commitment to stamping out aggressive enforcement of this type. However, in one particular car park, Devere have gone a step further. The Prankster was informed that a motorist received a parking charge because their permit blew off the dashboard in the wind. The motorist appealed, which was declined. The motorist then appealed to the IAS. This body has all the characteristics of a kangaroo court, so it is no surprise the IAS 'Barista' also declined the appeal. Although Devere are quite happy to charge the motorist in this manner, they fail to provide proper management of the car park. Twice this month the motorist has been unable to park in their allocated bay and has been forced to pay for parking elsewhere. 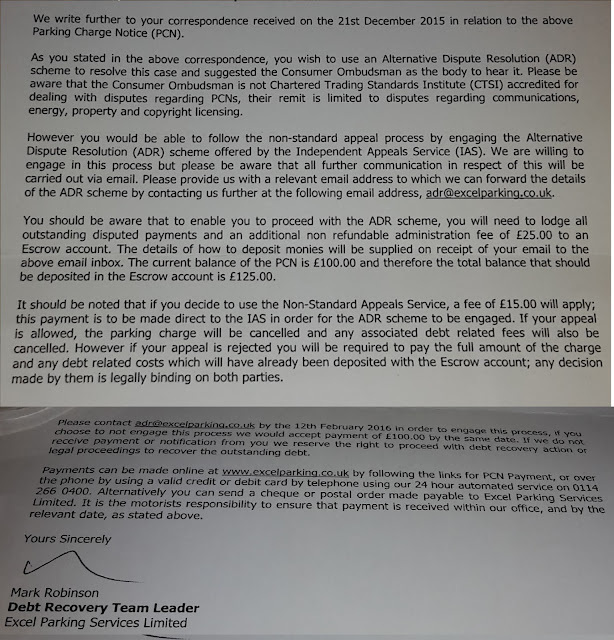 Devere's operation therefore appears to be based on making money for Devere without providing a proper service to legitimate car park users. It is no comfort to a motorist if the person in their parking space had to pay £100 to Devere. The service therefore appears to be worthless. Following the IAS appeal the motorist was advised they had to pay by 20/2/2016. However, this was not quick enough for Devere, who held the motorist's employers to ransom by refusing to issue replacement permits until the motorist has paid the charge. If you are a landowner considering using Devere, then you might want to consider whether you appreciate your tenants being held to ransom in this manner, and whether it is worth using a parking company who do not appear to be able to control a car park to keep out unwanted vehicles but are happy to victimise genuine users with aggressive enforcement.. The claims business appears to be turning out well for Gladstones Solicitors, who file claims and prepare witness statements on behalf of parking companies. Gladstones keep costs down by doing no due diligence and filing whatever their customers give them. This does cause a little embarrassment at times, but overall seems to be a winning strategy for keeping the money rolling in. Well done Gladstones and we look forward to seeing the shiny new offices. Excel Parking are in some cases charging a non-refundable £40 to appeal their parking charges. This is broken down as £25 to Excel, and £15 to the Independent Appeals Service. The full parking charge of £100 also needs to be placed in an escrow account so that once the IAS go through the formalities, Excel can take your money without any hassle. Ombudsman Services is approved by CTSI to provide approved ADR procedures across a wide range of consumer sectors including retail, motor, home improvements, copyright and trade schemes. Also see below under other Competent Authority approvals. Ombudsman Services (OS) has a number of brands including OS: Energy, OS: Property, OS: Communications, and OS: Consumer Ombudsman and each brand deals with a different type of complaint. So if a consumer wants to complain about their energy supplier, they can take the complaint to OS: Energy, or if they want to complain about their broadband supplier they can take the complaint to OS: Communications. 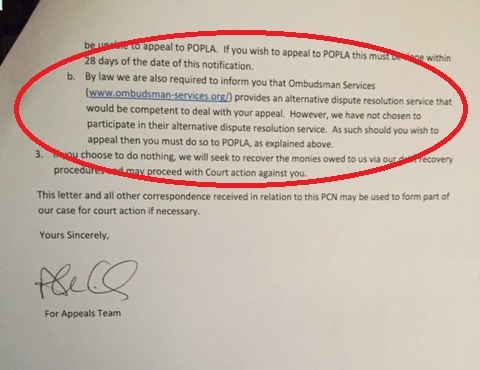 Where a motorist wants to appeal their parking charge (from a BPA member), they need to use POPLA which is administered by Ombudsman Services, but is not an Ombudsman scheme. When the new ADR regulations came into effect, it became compulsory for businesses to signpost complainants to a certified ADR body. Many businesses were already part of ombudsman schemes because government or trade bodies had mandated it (eg. banks using The Financial Ombudsman, Solicitors using The Legal Ombudsman, Energy Companies using OS: Energy etc.) but that did leave many businesses in a position where they hadn’t previously had any requirement to use an ombudsman scheme. In some instances, there weren’t ombudsman schemes established that could take complaints from various business types. When the ADR directive came about, numerous additional ombudsman and ADR schemes were created to give the consumer somewhere to turn, and give retailers/businesses a certified ADR provider they could signpost to. One scheme created and certified was OS: Consumer Ombudsman. The new ADR regulations referred to are the Alternative Dispute Resolution for Consumer Disputes (Competent Authorities and Information) Regulations. Regulation 19 requires all companies to inform consumers of a qualified ADR Entity to deal with a dispute once the internal handling has ended. 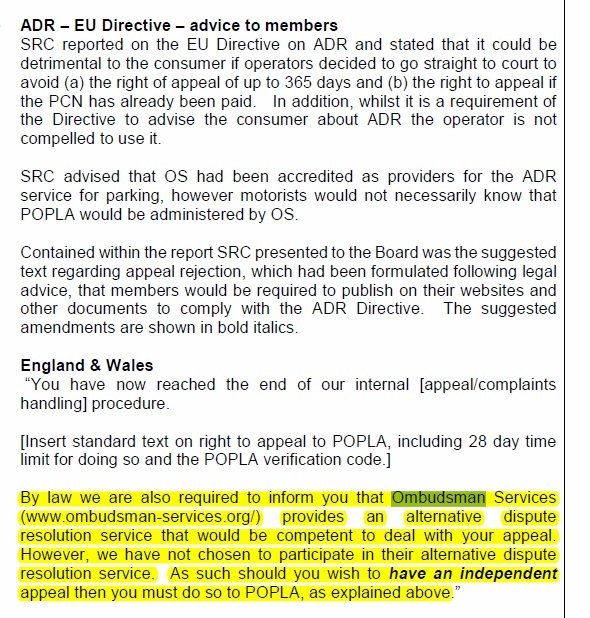 The British Parking Association use Brand POPLA* to deal with their member's disputes once internal handling finishes, but as POPLA is not a qualified ADR entity, then BPA parking companies are still required to list at least one which is. However, and this is where things may get confusing, although they are required to list an ADR Entity which is competent to deal with the dispute, they are not compelled to actually use that entity. Recommending the rival IAS would probably stick in the throat, and so Ombudsman Services are recommended instead. Here is an example from BPA member CARE Parking rejecting a motorist's appeal. The Prankster contacted Ombudsman Services to check that the message given by the BPA was correct. I blog about parking related matters as The Parking Prankster, and as such I have a large number of motorists emailing me each day for help. If motorists cannot use POPLA (eg if they are in Scotland) I would like to advise them to use your other ADR service instead. My feeling is that it is always better to try and resolve disputes rather than using the court system. However I cannot find details on your website on the link provided by the BPA. Please can you confirm that you do run an ADR Entity competent to deal with parking matters, and if so provide me with full details and the correct link to use to which I can refer motorists to. The Prankster received a detailed reply which stated the matter would be handled under the Consumer Ombudsman brand, which is essentially an 'ADR Entity of last resort', handling consumer disputes not covered by other mandatory provisions. This would be better handled using this web link, rather than the one given by the BPA. However, although Ombudsman Services could deal with parking related matters, it would require the co-operation of the parking company. The process would also operate in a different way to POPLA. Even though Ombudsman Services do currently administer POPLA, this is under a different scheme which is not ADR Entity approved. The practice directions for pre-action conduct make it clear it would be unwise simply to ignore Excel's offer of ADR. Awarding costs on an indemnity basis removed the protection of the small claims track costs limitation, and therefore should be avoided. However, using the IAS is not a sensible option. The Prankster has already exposed the IAS as having all the characteristics of a kangaroo court. Even parking companies agree on this. The motorist might as well burn £40 and send £100 to Excel as use the IAS. The motorist should therefore reply robustly to Excel. Your information is incorrect and I can confirm the Consumer Ombudsman is qualified to assist with our dispute. You can confirm this by contacting them at Ombudsman Services, The Brew House, Wilderspool Park, Greenall's Avenue, Warrington, WA4 6HL. Additionally, The Consumer Ombudsman is free to consumers. Please therefore indicate whether you are now willing to use their services to attempt to resolve our dispute. I remind you that failing to respond at all to an offer to use ADR is against pre-court protocol and if this matter proceeds to court I will ask the court to award my full costs on an indemnity basis regardless of the result of any hearing. I robustly reject your offer to use the IAS for several reasons. Firstly, it is not reasonable to expect me to pay a non-refundable total of £40 for a dispute over £100. Secondly, and most importantly, the IAS has been exposed as having serious flaws and so it does not make sense to agree to a binding judgment by an organisation whose findings are regularly overturned in the courts. Additionally, although the IAS currently has ADR Entity status, this is under review by the CTSI because the IAS does not meet the statutory requirements. I understand the IAS has a limited time to improve, and after that ADR Entity status is lost. These are all well-documented and I can provide more details if you require. I would be prepared to consider using the IAS once it meets all these statutory requirements. If this is acceptable then I suggest we defer the matter for now and that you contact me again once the CTSI has re-verified the IAS. If this is agreeable I will draw up a draft contract which you can sign and return togeether with a non-refundable cheque for £15 which I will use to appeal to the IAS. *POPLA is a brand, which means that different organisations can deal with POPLA appeals. Some appeals will be deal with by Ombudsman Services, and some by parking company debt collectors. Civil Enforcement Limited have been found to file even more claims against motorists in places where their contracts have been terminated. This report in the Ipswitch Star tells the story of 10 workers at the B&M store in Copdock Ipswitch who were issued tickets incorrectly by CEL in May 2013. The workers were informed by the store that as workers they had permission to park. However, now CEL have had their contract cancelled they have resurrected the tickets and taken the workers to court. This is not an isolated incident. The Prankster previously blogged about the case where CEL filed claims once their contract at a hotel was cancelled. Before that, The Prankster blogged about other cases, such as retail stores and train stations. Any landowner thinking of making a contract with Civil Enforcement or Creative Car Parks should think long and hard before putting pen to paper. CEL have already filed revenge claims against hundreds of motorists. This pattern cannot be accidental so you use them at your peril. If you think parking companies should not file revenge claims once their contracts are cancelledconsider signing Barry Beavis's petition asking for regulation of the industry. The British Parking Association have apparently appointed Wright Hassall to deal with the stayed POPLA cases, although they have not yet confirmed this. Wright Hassall operate at the debt-collection end of the parking industry, sending out second stage debt collection letters on behalf of Gary Osner's firm ZZPS, and also filing claims on behalf of parking operators. This is therefore far from an independent appointment and The Prankster thinks it a wholly inappropriate choice. There is now a huge of a conflict of interest. Wright Hassall already have relationships with the parking companies and have assisted with filing a number of claims. This means that they will potentially be having to deal with appeals involving their own clients. Even worse, as some courts have referred cases back to POPLA, there is also the possibility they will have to deal with their own cases. If Wright Hassall start finding for motorists, what will they do about the similar cases they have filed on behalf of their clients? Will they recommend to their clients that they drop them? Will they feel obliged to rule for parking companies in order to not lose current customers and to not lose potential future customers. After all, its hardly a deal winner to have to say to your prospective customers that most of your claims are baseless. 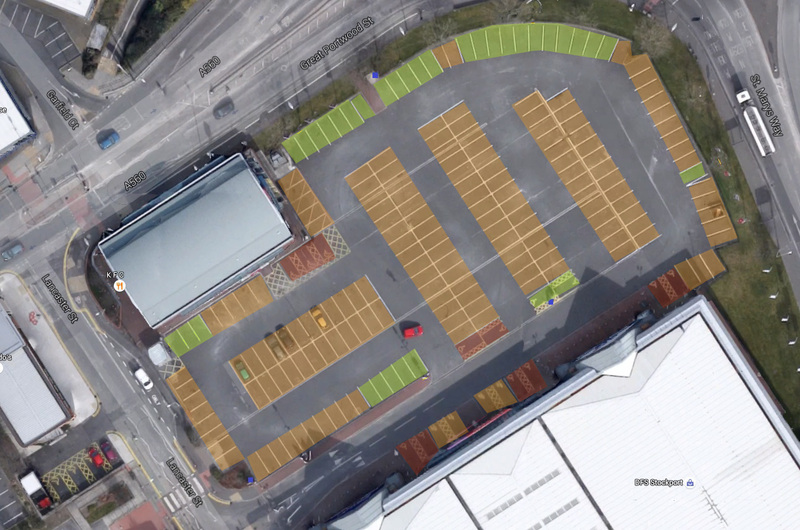 If the appeal is turned down, and the motorist disagrees, will Wright Hassall be allowed to tout for business and file a claim on behalf of the parking company? The Independent Appeals Service is secretive and furtive about the solicitors it uses for its decisions. There is therefore the possibility that Wright Hassall personnel also work for the IAS. As the IAS decisions are highly controversial, often showing either no parking related knowledge or obvious bias, this is a secondary worry. Aptly named for the nuisance factor they case to motorists. But not it seems a company who can deliver an independent service for the stayed POPLA appeals. If you think that appointing a parking debt collector to hear stayed appeals is the wrong choice then consider voting for Barry Beavis's petition to introduce regulation into the private parking industry. This article in the Mirror details how ParkingEye hit two pensioners for over half the basic standard weekly pension (£115.95). The pensioners were charged £85 for being stuck in a queue trying to leave St Peter's Retail Park in Mansfield. The park allows 45 minutes free parking and the pensioners were 15 minutes over the time because the car park was gridlocked. The traffic lights changed 4 times before they were able to exit. The British Parking association code of practice requires a minimum 10 minute grace period for leaving a car park, and an unspecified grace period on arrival to park, find the signage and read it. The Prankster considers that a 5 minute grace period to do this is not unreasonable, especially considering the motorist was in his 70s. ParkingEye will therefore have been in breach of the code of practice for issuing this charge. The couple panicked and paid at the reduced rate of £50 because the letter arrived only a few days before the discount expired and the full amount became payable. 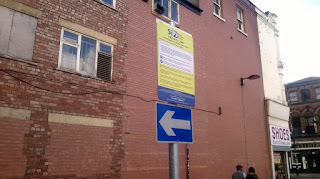 ParkingEye's signage and cameras are currently installed illegally at the park, and they were ordered to apply for planning permission on 26 January 2016. The park has been blighted by ParkingEye for a long time. In 2012, Councillors passed the following resolution. 1. This Council condemns the practices of Parking Eye Ltd at St Peter’s Retail Park particularly in their use of CCTV number plate recognition as they discriminate against disable users of the retail park, impose extortionate charges upon shoppers using the park and have failed, through inadequate signage, to properly advise users of the retail park as to the terms and conditions of parking. That the company sets up an appeals system run by a third party so that appeals against future alleged breaches of the parking regulations are dealt with fairly. 3. That the Managing Director shall write to the owners and managing agents of the retail park informing them that they expect Parking Eye Ltd to meet the Council’s requirements as set out above to make the car park user friendly to encourage, not discourage people to visit the retail park. Sadly this does not seem to have been followed through. The Prankster has not asked Lord Neuberger to comment, but if did, he would probably have said all the couple needed was a watch. And a bulldozer. ParkingEye recommended to the Supreme Court that people who do not like being charged by them avoid their car parks. The Prankster thinks this is sound advice, but sadly for Mr and Mrs Burditt this will have come too late. If you think that pensioners should not be treated in this way for matters outside their control, and that £85 is far too high a charge compared to the standard pension, then consider signing Barry Beavis's petition, asking the government to regulate private parking. The Prankster apologies for the possibly misleading blog title. Obviously it is not possible for something with zero credibility to fall lower. This case, reported on pepipoo concerns a motorist who visited a Parking Awareness Services car park. There were two signs which caught her attention. One said that the car park was in operation 24 hrs/day and the other that was hand-written said “All day parking £7” with no indication that the ticket would expire before midnight. She therefore spoke to the attendant and asked for an all-day Parking Ticket and specifically informed the attendant that she was visiting the Blackpool Pleasure Beach. The attendant did not at any time ask when the she intended to return. The car park was almost next door to the Pleasure Beach and the attendant would be fully aware that it did not close until 10 pm. The attendant did not at any time before or after issuing the parking ticket warn the motorist that it would expire at 7 pm. The Attendant, after writing the ticket himself, placed it in the windscreen without showing it to the motorist. On returning after 7 the motorist was surprised to find a parking charge. She therefore appealed to the operator, and when that was rejected to the Independent Appeals Service, which also rejected the appeal. The motorist, correctly realising that the IAS had all the characteristics of a kangaroo court, knew the decision had no validity and so decided not to pay. The kangaroo court stated it was the motorist's responsibility to produce photographs of signage, which of course is a complete reversal of the ways courts behave; in a real court it is the claimant's responsibility to prove their case. Matthew Wild of PAS, no doubt emboldened by the IAS decision, eventually plucked up enough courage after 8 months to file a court claim. He decided not to use Gladstones Solicitors, no doubt reasoning that he was perfectly capable of losing his own case, without the need to pay fees to Gladstones to lose on his behalf. This duly happened, and the claim was dismissed on the grounds that no contract could have been formed. There was a lack of signs stating an expiry time, so as the motorist was not aware (and could not reasonably be aware) of the 7pm time limit on the ticket at the time they purchased the ticket, the terms of the contract were void. (Prankster note; the ticket was merely a receipt that could not introduce a new condition. Thornton v Shoe Lane Parking (1971) is case law which explains this). Mr Wild therefore had to shell out an estimated £200 or more, but on the plus side he did get two very nice days out in Stoke, which no doubt made the whole thing worthwhile. The IAS is a cruel joke on the less able members of the IPC, who have little or no knowledge of the legal areas around parking on private land. The IAS baristas are equally talented, which makes the situation something of the blind leading the blind. Winning an IAS appeal raises expectations of the parking operator that they actually have a case. As we see, a real judge takes the opposite view. This does not help poor Mr Wild, who is now £200 lighter, albeit he may now have many happy tourist memories of Stoke. As he has also forked out £15 for the IAS appeal he might well be coming to the conclusion that this forum shopping malarkey is not all its made out to be. 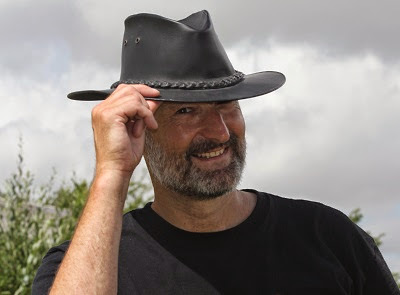 If you think the IAS is a cruel joke on operators and the government should step in to put them out of their misery, consider signing Barry Beavis's petition. UK Parking control are sailing pretty close to the wind. Currently they are on maximum sanction points and one more offence will see them banned from the DVLA database again, and facing possible expulsion from the BPA. It therefore came as a surprise to The Prankster to find they had been issuing tickets on land where they had no authority. Although they have signage in the vicinity and have been issuing tickets since 2012, this week they started to trespass on private property and issue one resident multiple tickets on his own driveway. Thankfully a robust letter sorted the problem out and UKPC have cancelled the charges and promised never to issue tickets there again. The landowner is now happy. Happier than his neighbours in fact, some of who have paid up for these bogus charges in the past as this was the only way to stop the threatening letters. Issuing parking charges without authority is a breach of the code of practice. Will Hurley and John Davies run the Independent Parking Committee. Their members are essentially the bottom feeders of the industry, using dodgy tactics and pushing the envelope of what is and is not allowable. Recently for instance, some of their members stopped allowing vehicle keepers to appeal either the notice to driver or the notice to keeper. This is ironic since their appeals service, the Independent Appeals Service, fits all the criteria for a kangaroo court and finds increasingly desperate ways to avoid allowing motorists appeals. John Davies boasted his service only allows 20% of appeals and even one of their own members accidentally revealed the service's results were a formality. The IPC attract the worst of the parking companies and it has been said that each time a company leaves the British Parking Association for the IPC it simultaneously raises the level of ethics in both trade associations. The jewel in the IPC crown is Excel Parking/Vehicle Control Services. The Prankster is disturbed to find out that VCS have found a tactic which hits a new low, even for IPC members. According to this post on moneysaving expert, VCS are now issuing tickets to vehicles for stopping where stopping is not permitted - while queuing at a barrier! This tactic is particularly disturbing because this is the barrier to the hire car return pool, and typically hire companies will add an extra £50 or more on to any parking charge for administrative purposes. Although their contracts generally do not allow them to do this, this does not stop them and it is then a fight for the motorist to get their money back. The parking charge was issued by the VCS mobile car who doctored the evidence by cutting off the car that was at the barrier from the picture but you can apparently still see 3 cars in the queue and the wheels turned on the motorists car in order to get through the barrier. It is clear then this is a deliberate move by the VCS car operator, and since the headquarters staff (who have full access to the CCTV and vehicle location) did not quibble and still issued a PCN it appears this odious practice must have been condoned by management. The Prankster has been banned by Will Hurley from contacting the IPC to report incidents like this, but when The Prankster reported similar evidence doctoring to the British Parking Association this resulted in UK Parking Control getting banned from the DVLA for forging timestamps on photographs. The Prankster will therefore wait and see whether anything happens about this, or whether Will Hurley and John Davies are too scared to discipline their top customer. In The Prankster's opinion, if Will Hurley and John Davies do not stamp this practice out and impose a temporary ban as a warning to others, this will confirm them to be shysters of the top order, condoning the worst practices of the private parking industry. If you think people like Will Hurley and John Davis are not competent to regulate the parking industry, consider signing this petition to ask the Government to look at the issues. The Prankster previously blogged that Civil Enforcement Limited were filing claims where they were not giving out any details apart from the name of the car park - no date, vehicle registration, reason for claim, initial parking charge, or indeed anything useful which would give the recipient anything to go by to understand what the claim was about. One common theme was that the sites were all ones where CEL no longer had a contract. It seems as if CEL were getting revenge on landowners for daring to cancel their contract with them. This moneysavingexpert report details another claim. CEL originally tried to scam the motorist back in 2013/4 by issuing a ticket even though they were displaying a permit. The manager of the hotel assured the motorist the ticket would be cancelled and the motorist heard no more. Perhaps CEL pushed their luck and tried the scam once too often, because the hotel cancelled their contract in Febriuary 2015. CEL decided to punish the hotel by resurrecting old tickets and filing claims. The motorist contacted the hotel and had difficulty getting through due to the large number of other motorists also phoning to complain. The motorist found the original letter from the hotel manager informing them the charge would be dropped and therefore filed a counter claim. Today the motorist has been contacted by the hotel informing them that CEL have dropped their claim, not only against them but also against 20 other similarly affected motorists. The Prankster has also been informed that the BPA has received a number of similar complaints. Any landowner thinking of making a contract with Civil Enforcement or Creative Car Parks should think long and hard before putting pen to paper. CEL have already filed claims against hundreds of Co-op employees getting revenge on sites once The Co-op cancelled their contract.. Now this pattern has been repeated at a number of other sites. Although CEL have dropped their claim against the motorist, the counter claim will still stand. The motorist has promised to keep moneysavingexpert informed of developments. If you think parking companies should not file claims without giving reasonable information on what the claim is about, and should not file frivolous claims once their contract has been terminated, consider signing Barry Beavis's petition asking for regulation of the industry. This post on moneysavingexpert describes how Morrisons has become a ghost town since ParkingEye began enforcement in the car park. The in-store cafe which normally would be full up with about 100 people now only had 6 at lunch time. The manager confirmed this was not unusual and that the store was often like this now.He explained that since ParkingEye started enforcement he has had many many complaints and lost many customers. ParkingEye made it quite plain to everyone in the Supreme Court that if people didn't like their terms and conditions then they should park elsewhere. Consumers have apparently taken them at their word and have voted with their feet, at least at this store. 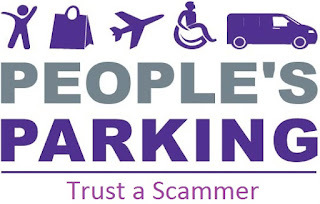 The Supreme Court ruled that having ParkingEye working the car park for profit was beneficial to retailers, but it seems this is not always the case. This store proves the opposite is sometimes true. Somerfield also found the need to get rid of ParkingEye, paying £300,000 to terminate their contract. B&Q were even more desperate, forking out an estimated £400,000 to dispose of ParkingEye in a desperate attempt to stop the flow of leaving customers. The plain fact is that it is not safe to park in a ParkingEye car park (even if you have got a watch). Their ropy technology and shoddy installations are apparent to The Prankster from the complaints he gets every day.